The Cavalry of the Clouds in the First World War? How about this for an opening paragraph? January 15th, 1918, was a cold, sparkling, sunny day. Not much happened in the Great War that day. As usual, about two thousand men (of the millions along the Western Front) died; some because they stuck their heads up too high and got shot; some because they got their feet wet too often and caught pneumonia; many by accident; and a steady few by their own hand. It was one thousand two hundred and sixty days sine Britain and Germany had declared war. Not that anyone was counting. 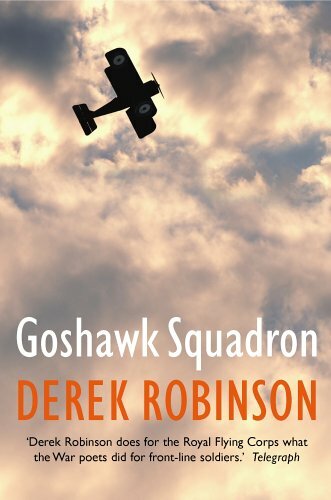 So begins Derek Robinson’s 1971 novel about the Royal Flying Corps, Goshawk Squadron. It is now regarded as something of a classic – and it’s easy to see why. Set in the last year of the war, the opening paragraph sets the tone: matter-of-fact and sardonic, cynical and war-worn. Robinson searingly conjures up the brutality and insanity of war, as these young men, commanded by a deranged and fatalistic young major, Stanley Woolley (aged only 22), flew S.E. 5‘s (see left). They were lambs to the slaughter, in some ways even more vulnerable in their flimsy planes than the millions ranged in the trenches thousands of feet below them. ‘It was pretty horrible,’ said Kimberley severely. As Robinson says in the afterword, he was deliberately seeking to shatter the myth of airborne chivalry, Lloyd-George’s so-called cavalry of the clouds. Far from fighting with decorum and dignity, the only hope was to get the other guy in the back before he got you – no evenly matched noble dogfights here. Woolley is determined to see his young recruits kill rather than survive – he doesn’t even bother to learn some of their names – because he knows they won’t last. 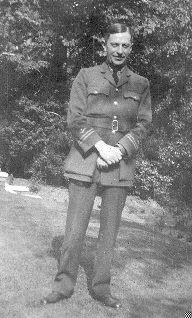 Goshawk Squadron does in prose what so many of the greats like Sassoon, Wilfred Owen, and Rupert Brooke did in poetry. It’s an extraordinary read. Now, regulars may well wonder what on earth sparked reading this book. Well, my great-grandfather, Henrik Loeffler, (right) was British (having naturalised aged 14 when his father did, having been born here 1876), despite the fact that the rest of the family had all been born in Germany. He subsequently married a Swedish wife, and lived in England for the rest of his life – but even more extraordinarily, he himself was a member of the Royal Flying Corps (although we’ve not yet established what his role exactly was). So he fought for the British … against the Germans.